An article published in the journal “Astronomy and Astrophysics” shows an example of the use of a neural network and a deep learning algorithm to reduce the time to create simulations of star systems formation obtaining even better results. Yann Alibert of NCCR PlanetS and of the Swiss University of Bern and Julia Venturini of the International Space Science Institute (ISSI) of Bern and a PlanetS collaborator developed this new system that predicts the mass of a planet starting from the conditions in which it formed with a excellent accuracy and a much higher speed than models based on differential equations. The problem lies in the computer models developed over the years by researchers who are studying the formation of planets to try to simulate them faithfully. In 2014 the National Center of Competence in Research (NCCR) PlanetS opened in Bern, which brings together researchers from various Swiss institutions such as the universities of Bern, Geneva and Zurich together with ETH Zurich and Lausanne to provide an interdisciplinary research program dedicated to the study of the origin, evolution and characterizazion of planets. Among the activities that had a strong development at NCCR PlanetS there’s the one abou computer models that simulate the development of star systems. Supercomputers are becoming increasingly powerful yet the differential equations to be solved to calculate crucial data about the mass of the gas envelope at the origin of a planet require huge hardware resources to obtain results that can still be inaccurate. To try to improve the situation, Yann Alibert, a scientist at the center, and Julia Venturini, who works with the center, developed a different approach, which uses systems whose applications are in remarkable growth such as neural networks and deep learning. 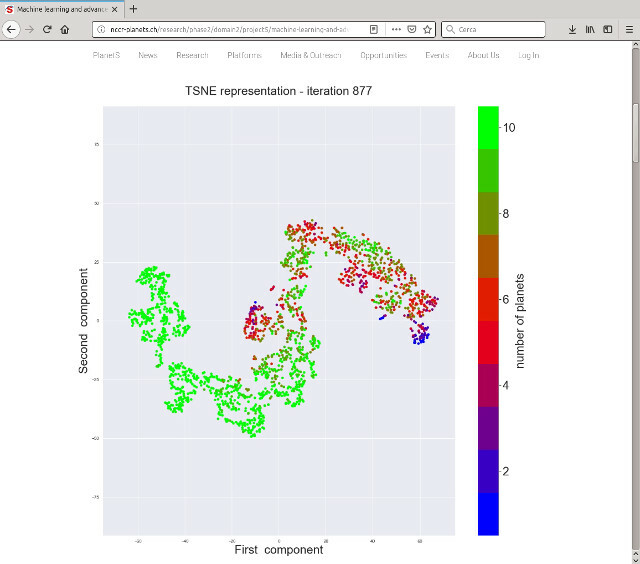 The image (courtesy NCCR PlanetS, all rights reserved) shows a screengrab representing a moment of the products of a T-distributed Stochastic Neighbor Embedding (T-SNE) algorithm applied to the simulation of planet development. The single image has little or no meaning but is a moment of a run for an algorithm based on a large database created by calculating millions of possible internal structures for the planet on a neural network architecture created specifically and subsequently trained. The results show that the approach based on deep learning is better than the one used previously because after the training phase the system is faster and more precise. Potentially it’s a leap forward in the simulation of star systems development as it can increase the ease for researchers to study planets’ development processes and improve their models.